Coverage: Live on BBC Radio Wales, BBC Radio Cymru and BBC Radio 5 live, plus live text commentary on the BBC Sport website. Spirits are high in the Wales rugby camp before their World Cup Pool A showdown with Australia at Twickenham - and it's not just the ghosts in the team hotel. Wins over Uruguay,England and Fiji coupled with the hosts' capitulation to the Wallabies have meant Warren Gatland's squad have been contemplating who, and not if, they will play in the quarter-finals. With the spectre of failure lifted, this week's media duties have lacked the edge so evident in the build up to their critical 28-25 win over England. The official lines are obvious: Win the pool and earn an easier route to the final - that is, one that avoids the possibility of playing South Africa and the All Blacks. The conviction in the answers is genuine - professional sportsmen want to win. But if anyone had offered Wales qualification with a game to spare on the day the draw for the 'group of death' was made their hand would have been removed with sharp teeth. With the jeopardy removed, and Wales reporting a clean bill of health for all their squad on Tuesday, the media pack needed something they too could get their teeth into - and Samson Lee's revelation that Dan Lydiate had seen a ghost in the team hotel was the sideshow they yearned for. It turns out that room 1313 - where Lydiate and Sam Warburton were staying - at the Oatland Park in Weybridge has a history of reported paranormal activity. The dining room, too, has a grey lady who makes regular appearances and - as befits a spook - walks through a wall at the west end of the room. Well, as rugby and broadcasting legend Ray Gravell would have said, west is best. Come Wednesday and Paul Stridgeon, the Toulon fitness and conditioning man drafted in to help Wales' preparation for the tournament, is answering questions about how the management prepare players to deal with phantasms. "It was a problem for the first couple of days because once Lyds saw it and could get back to sleep Warby couldn't get back to sleep, so he was a bit tired for the first couple of days," said Stridgeon. Welcome to the Twilight Zone. Wales captain Sam Warburton tells Scrum V he was impressed with Australia in their win over England at Twickenham. "It wasn't something we'd put in the brief. It wasn't something we'd bargained for really. But as support staff we have to deal with whatever's thrown at us so we've put the necessary things in place and the boys will be good to go." How can the support staff assist players with things that go bump in the night, was a reasonable next question. "Spooning them while they go to sleep - that helps," came the joking reply. "A little team talk before they go to bed: 'listen, if the ghost comes, just give us a call'." Centre Jamie Roberts, asked about the same thing, replied: "I don't believe in ghosts - until I see one!" Back-rowers Justin Tipuric and Taulupe Faletau might be the better people to ask, they are in room 1313 now. The contrast to the trial by media that England have faced this week could not be more stark - that, it seems so far at least, is the cost of elimination in the pool no-one wanted to be in. There was no chill in the atmosphere in the hotel reception where senior members of Wales management chatted with members of the media. 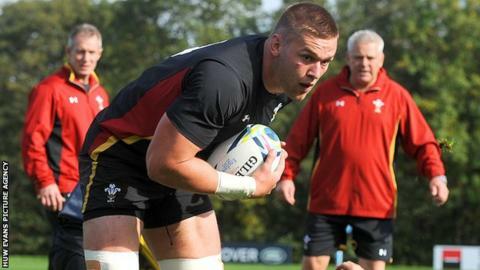 Before playing England, Wales were embroiled in a row over using players in training that should not have been involved. A frustrated head coach Gatland put one journalist on the spot and accused him of "not knowing what you're talking about", albeit with a smile on his face. But behind the new bonhomie and cheerfulness there remains a hard question. Can Wales overcome Australia, a team who have won the last 10 meetings between the countries? And while no-one will say it for fear of showing disrespect to potential opponents, the Welsh can secure a course to the final that does not involve a resurgent Springboks and defending champions New Zealand. Few of this Wales team know what it's like to beat the Wallabies in a Test while wearing the three feathers. Of the current squad, five - Jamie Roberts, Gethin Jenkins, Alun Wyn Jones, Luke Charteris and James Hook - were in the matchday squad when Wales won 21-18 in 2008. Jenkins and flanker Dan Lydiate have started in nine of the ensuing 10 losses. Captain Sam Warburton in eight; George North in seven; Alun Wyn Jones, Taulupe Faletau, Bradley Davies and Alex Cuthbert in six. Roberts does not believe there are psychological issues surrounding beating the Wallabies. The centre does, however, believe in Wales needing to last the course against them. "You look back at the last seven years and it's the same old story, the last 10 minutes has killed us on many an occasion and we're hoping on Saturday what's on the line will bring out the best in us for the full 80 minutes," he said. It shouldn't be forgotten that Wales are in Pool A with Australia and England because of Kurtley Beale's last-minute try at the Millennium Stadium in December 2012. That particular loss to Australia cost Wales their top-eight ranking at the time and dropped them among the third seeds for this tournament and that - coupled a bit of bad luck of the draw - led to the Pool of Death. Wales have exorcised the ghost of that match by reaching the quarter-finals - the question now is can they put the Aussie hoodoo to rest? Will it be 11th time lucky for Wales? Read more on Will Wales finally beat Australia at the 11th attempt?